“To entitle him to Patent Grant giving fee simple title, he shall continuously maintain his home upon the premises for a term of six years and have at the end of such term 25 per cent of the premises under bona fide cultivation, or shall have maintained his home continuously upon the premises for four years and have under cultivation, at end of such period, 50 per cent of the premises”. “Mr Curtis (also) started a general store after which a postoffice was allotted to ‘11 miles’, as (the town) is colloquially known on Hawaiʻi.” Curtis sold it. That seems to be the question of some, because in the district of Puna on the Island of Hawaiʻi what once was called Olaʻa is now called Keaʻau. So why did it change? Let’s look back a bit. Part of the confusion may be that Olaʻa was formerly called Laʻa, a legendary area for collecting bird feathers. (Ulukau) To further confuse things, some scholars believe that ʻOlaʻa is misspelled, and should be spelled as ʻO-Laʻa. Laka is the goddess of the upland forests worshiped in the hula dance. (Beckwith) Since Laka is guardian of the forest, her name is invoked by hula dancers and others when entering the forest. Forests once covered much of ʻOlaʻa; they were later (1905-1928) made part of the forest reserve system within the Islands. The forest lands of ʻOlaʻa were noted for their growth of ʻohiʻa and koa trees, and hapuʻu tree fern. What is consistent and clear from testimony before the Land Commission, there definitely was an Olaʻa in upper Puna on the Island of Hawaiʻi. The testimony is equally consistent and clear that there also was a Keaʻau. So, what happened with the ʻOlaʻa – Keaʻau name changes? Soon, sugarcane was in large-scale production. Initially founded in 1899, ʻOlaʻa Sugar Company leased about 4,000-acres of land, expanded and eventually became the dominant operation in the region. Plantation fields extended for 10-miles along both sides of Highway 11 between Keaʻau and Mountain View, as well as in the Pāhoa and Kapoho areas. Construction of centrally-located ʻOlaʻa Sugar Mill was completed in 1902, requiring 51 men working a three-shift operation. This industrial expansion marked the beginning of massive landscape alterations and clearing operations. A community grew around the plantation. Attention to employee welfare was demonstrated by ʻOlaʻa Sugar Company in the housing program, free medical attention and recreational facilities. ʻOlaʻa modernized the housing by building new family units and relocating outlying houses scattered about the plantation into nine main villages. The plantation made land available for community uses. As examples, the ʻOlaʻa Hongwanji was built in 1902. Likewise, ʻOlaʻa Christian Church was nearby. ʻOlaʻa School, an elementary school, began in 1939. Other groups and places were formed using the ʻOlaʻa namesake. That changed … and, it’s not clear how or when the mistake was learned. In 1960, ʻOlaʻa Sugar Company became Puna Sugar Company. ʻOlaʻa Elementary School became Keaʻau Elementary and Intermediate School (later Keaʻau Middle School.) In the early-1970s, ʻOlaʻa Hongwanji became Puna Hongwanji. Not all early labels and references were incorrect; a 1914 USGS map appears to correctly label the place once known as ʻOlaʻa as Keaau. On May 3, 1899, Ben F Dillingham, Lorrin A Thurston, Alfred W Carter, Samuel M Damon and William H Shipman formed the Olaʻa Sugar Company and started what they believed would become Hawaii’s largest and most prosperous sugar plantation. By that time (and in the years following,) numerous foreign immigrants came to the Islands to work on the sugar plantations, including Olaʻa. There were three big waves of workforce immigration: Chinese 1852; Japanese 1885; and Filipinos 1905. Several smaller, but substantial, migrations also occurred: Portuguese 1877; Norwegians 1880; Germans 1881; Puerto Ricans 1900; Koreans 1902 and Spanish 1907. With the respective language barriers created by the influx of foreigners, plantations assigned interpreters to open lines of communication with the workers. One of those at Olaʻa was Juzaburo Sakamaki. In 1869, Sakamaki was the youngest child born in Hirosaki-Shi, Aomori-Ken, Japan to Hisao Sakamaki and Fumi Takasaki. His father died when he was 4; to make ends meet, his mother had to run a private boardinghouse. Inspired by a letter from a friend, at 15, without telling his mother, he stowed away on a ship bound for California to start a new life. After arriving in the US, Sakamaki went East to Pennsylvania, where he spent nine years studying and working. Receiving word that his mother was ill, he decided to return home. By the time he reached Hawaiʻi, he learned that she was already dead, so he canceled his plans to go on to Japan. At about this time, Olaʻa Sugar Company was established, and he was hired as the company’s only regular interpreter. As interpreter, Sakamaki was the only pipeline between the company and the Japanese immigrants who made up the majority of the labor force at Olaʻa Plantation. As assistant postmaster of the Olaʻa post office, Sakamaki was also involved in all the daily activities of the Japanese there. As the agent of the Consulate General of Japan in Honolulu he was also in charge of administering the immigrants’ family register items. In this capacity, he not only dealt with registrations of births, deaths, marriages, adoptions and other family matters, he handled remittances that workers sent home. Growing immigrant population, including those from Japan, started to concern some, in the Islands, as well as on the continent. Likewise, there was discontent among the sugar workers. This came to a head in 1920. Though the strike was on Oʻahu, its impact was felt at Olaʻa. It turns out the attack was on Sakamaki’s home. The dynamite had been set under the floor between the parlor and the dining room on the mauka side; the side of the house had been blown off. Sakamaki had sided with management during the labor disputes of 1920. The Territory of Hawai’i charged leaders of the Federation of Japanese Labor with conspiracy to assassinate Sakamaki in order to intimidate opponents of the strike and alleged, further, that the strike was part of a concerted effort to take over the Islands by Japan. It took the jury less than five hours to reach a verdict on the fifteen defendants. By the early 1920s many Americans had begun to look at Japan and the Japanese with deep suspicion. Some suggest it was the catalyst for legislation restricting immigration into the US. The subsequent Johnson Reed Immigration Quota Act ((Immigration Act of 1924) limiting the annual number of immigrants who could be admitted from any country to 2% of the number of people from that country who were already living in the United States in 1890 (down from the 3% cap set by the Immigration Restriction Act of 1921)) passed both houses of Congress with overwhelming majorities: in the House 308 to 58 and in the Senate 69 to 9. 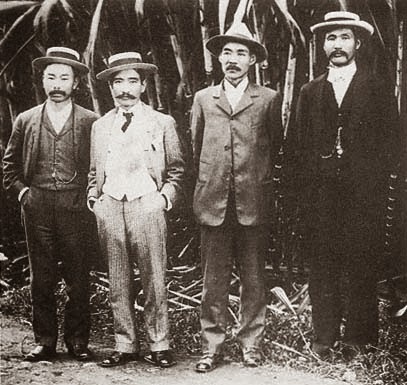 The image shows a photo of Juzaburo Sakamaki (second from left.) In addition, I have added some other images in a folder of like name in the Photos section on my Facebook and Google+ pages.